We have two versions of this document. This one is a slightly more formal and comprehensive version set out as an agreement to be signed by both parties. The alternative is drawn as a “terms and conditions” document which is non-negotiable. 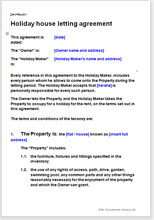 You can send that out in response to an enquiry or post it on your website Find it at Terms and conditions: holiday property.